The Orion III Pan Am 'Space Clipper' is a fictional spaceplane depicted in the film 2001: A Space Odyssey ascending from Earth to the wheel-like Space Station V. In the story, Orion III is a 213-foot-long commercial spacecraft operated by (now defunct) Pan American airlines. 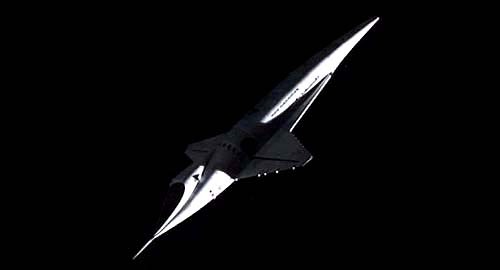 Although it is not shown taking off in the movie, it appears to be a single-stage-to-orbit vehicle and has a cranked delta wing shape like that of the Space Shuttle. In illustrations of Orion III prepared for the film by Harry Lange, the rear booster part of the spaceplane (the section aft of the retro ring, including the aft wing area) is shown detaching and falling away. However, this concept was not carried through into production because Orion III is seen reaching orbit with its booster still attached. According to the original screenplay by Stanley Kubrick and Arthur C. Clarke Dr. Heywood Floyd is the only passenger in the elegant cabin designed for 30 people. As Orion III approaches Space Station V, the two-man crew begin maneuvers which cause the spacecraft to rotate at the same rate as the station in preparation for docking. After production of the film was complete, director Kubrick ordered all models, sets, and plans destroyed.